Finding out you’re pregnant with twins feels like you’ve won the lottery. But when the excitement dies down a bit that’s when the nervousness begins to creep in. 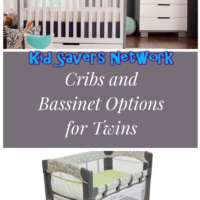 How do you choose the best crib for twins? Do you even need a twin crib to begin with? To help, we’ll discuss some options you have for newborn twins and beyond. Option 1: Separate cribs from birth. Wanting to help your partner sleep / an unwilling partner! Here are some of the best mini cribs with links to our reviews. Let’s look at both these options in detail now. 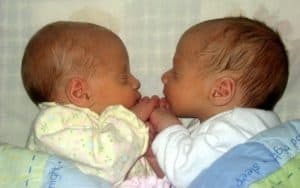 Some parents will put their twins in their own crib (or a single crib to start off with) immediately after returning home from the hospital. This seems to fit well with who multiples who spent time in the ICU. They are used to sleeping alone so you don’t need to worry about that. What you do need to worry about is getting good movement sensors and dual video monitors if the cribs can’t fit in your room. And for most families, they can’t! The second thing you need to be aware off is having to nurse every 2 hours or so. Many mothers like to take a nap in the nursery. This saves having to go backward and forward and potentially waking your slumbering partner. A small bed (such as a futon) is a great way to solve this particular problem. Some mothers also use a nursery recliner, which can be used for both nursing and napping. Mini cribs have a lot of advantages for parents of multiples. They’re cheaper, save space and are lighter to move between rooms. The good ones will also convert to twin beds, too. Space is likely to be at a premium now you have twins. With mini cribs, you can usually fit both of them top-to-tail against a single wall. If this is not possible you can dovetail your babies so they’re still in close proximity to each other. In any event, you’ll have an easier time fitting them into a room as opposed to two standard cribs. An advantage many parents overlook is that mini-cribs are lighter and narrower. This means that you can move them from room to room easier. They’ll fit through doorways and some even have wheels. The second option seems to be the most popular for many mothers. 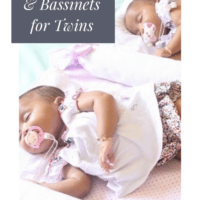 For the first 6 months or so, a bassinet or co-sleeper is used and then the twins are moved. They could be moved directly into their own cribs or into a single crib first, and then their own. This option works well provided you have space in your room. It’s also great for nursing and if you’ve had a c-section. Of course, your partner needs to be onboard and it won’t suit some couples. For twin bassinets, the Graco Pack and Play is a very popular choice. You can read our review here. We’ve found that some parents preferred the Joovy Room2 as it’s sturdier. For co-sleeping, the Arms Reach Co-Sleeper is the go-to choice for parents of multiples. There are two issues to be made aware of. First, your twins might not take to well to being cooped up in super-close proximity. The second is (like bassinets) you can’t use a co-sleeper for that long. It won’t be that long until your babies outgrow it, though some parents have reported their twins fitted until 6 months so it seems to be a “per case” basis. If you’re short on space with twins, the Baby Trend Nursery Center is ideal. Let’s be honest. If you’ve decided to take the twin bassinet option, the product that many parents of multiples prefer is the Graco Pack and Play (reviewed below). However, it would also be fair to say that this Baby Trend product has better features. Let’s start with the bassinets themselves. With the Baby Trend, you get two “Rock-a-bye” bassinets with handles. That allows you to lift them out of the play yard and take them with you around the house. In comparison, the Graco Bassinets are only removed when your twins outgrow them. As a result, the fabric is not as thick. Like the Graco, you can wheel the bassinets from room to room and there is a brake, too. Also similar to the Graco, you can fold up the play yard fairly easily and put it into the included travel bag. You also get a free changing table, an organizer for nappies and wipes and two sound machines. The sound machines are really the best part of the deal. I say this because they have a night light and a vibrational setting, too. The rocking action of the bassinets is perhaps not that impressive (though with newborn infants that’s probably a good thing!) but the vibrational setting is great for soothing and getting them off to sleep. You do need to know that there isn’t a mattress or bassinet sheet with the Nursery Center. There is a padded and firm mat instead. Spit Ups can be dealt with by wiping down the fabric, or hand-washing. Some parents do use a machine’s “Hand Wash” setting, but it isn’t officially recommended! 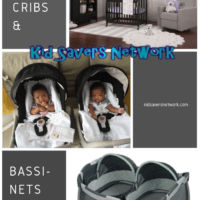 The bassinets are also “officially” good for up to 4-months, or 15lbs (whatever comes first). A lot of parents will transition them directly into a crib after a couple of months, or use the play yard. The only downside to this product is really the price! The Grace Pack and Play for twins are usually available for cheaper. If the added freebies and being able to carry the bassinets appeal to you, it’s probably worth the premium. The Graco Pack ‘n Play is America’s best-selling Playard, and their twin bassinet has been a bit hit with parents of multiples. 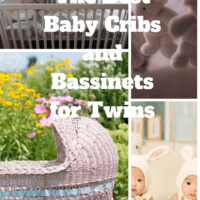 Some parents might prefer bassinets before moving twins to their own cribs. 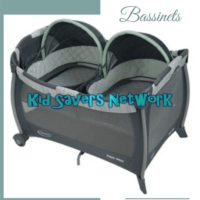 The obvious advantage with the twin bassinet is it saves a lot of space. This means you can have your little ones close to you in your bedroom. It also has wheels, so you can move it from room to room easily. An important point to note is you can not use the playard and the twin bassinet at the same time. You have to actually remove a few screws so you can’t have the best of both worlds. What this does mean is that once the twins become too big for their bassinets (3 – 6 months) you will still be able to use the playard. So you’ll still get some use out of it down the road. Another advantage of the Grace Twin Bassinet is its height. After carrying twins (and perhaps a c-section) the last thing you need is lifting not one but two babies from close to the floor. A lot of crib designs don’t take our poor backs into account! Overall, the feedback for Graco’s Twin Bassinet has been overwhelmingly positive. 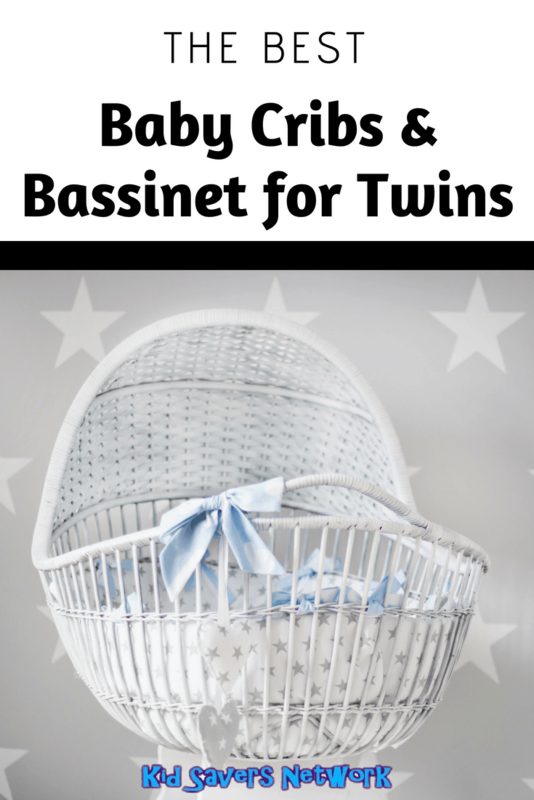 It’s generally regarded as “The Best Twin Bassinet On the Market”. It’s not without its critics, though. A few parents report that it sags in the middle, which is concerning. Others say it doesn’t! Other negative comments include the colors are drab and the crib sheet is hard to take off. 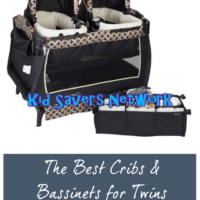 For the price, I think the Graco Twin Bassinet is the best twin bassinet for the money. The fact that it turns into a playpen means it will certainly get used one way or another. The Arms Reach Cosleeper is popular among parents of multiples. It’s large enough (providing you get the model pictured and not the “mini”) to place both babies inside. Another option some parents prefer is putting one either side of the bed. Of course, this will all depend on how much space you have, whether the little ones like it and how willing your partner is to move around during the night. This cosleeper is great if you like the idea of having your twins close enough so you can hear them breathe and move. This means you can feed them when you first notice the cues and there’s less chance of waking your partner. Another advantage with this kind of cosleeper is it can be moved from room to room. So you can take it into the living room for a nap whenever you want. Like many bassinets, the downside if the limited use you’ll get out of it. The weight limit is 30lbs – combined. This means that when your twins hit 15lbs it’ll be time to move them. This is usually around 4 – 6 months. On the plus side, the cosleeper can be used as a playard as well. There is a removable and washable liner which really helps keep it looking as good as new. This will help with the resell value of the cosleeper if you want to sell it afterward. One criticism the “Plack ‘n Play” often gets is that it’s not actually sturdy enough to hold two babies. Parents report that it bows in the middle after extended use. A well-made alternative is the Joovy Room2. With 10 square feet of room, it’ll hold two babies quite comfortably, and is quite a bit bigger than the Pack n Play. Another advantage to the Room2 is there is not a weight limit for using it. Joovy say you can keep on using it until your children are 35″ tall – just under 3 feet tall. So you’ll be able to use it for longer than the Pack ‘n Play as well. 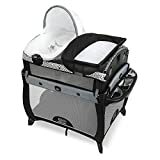 Safety is always a big issue with baby products and the Joovy Room2 is very sturdy (so pets won’t be able to knock it over) and there’s great visibility with no blind spots. I really like the fact Joovy have stood behind their product with a 2 – year warranty. I had a cheap playard that broke after only a few times of folding it up and it was out of warranty. A downside to this playard is you need to purchase a mattress. It does come with a fitted sheet but it is not as “Baby Ready” as the Pack ‘n Play. This sleek, minimalist designed crib will fit with any nursery room style. The great thing about this crib is that it has drawers underneath that you can use for extra storage. This is great if you are looking to save some space. You can quickly grab the things you need immediately such as burp cloths or change of onesies. With twins, this is really helpful. The Babyletto Mercer also converts to a toddler bed with a bed rail. You may still want to transition into a twin bed still later on. It has 4 adjustable positions for the mattress making it easier and safer for you to have access to your baby. One thing you need to look out for is the drawer. When your child gets a bit older they will love climbing in and out of it. Unfortunately, the drawer is just not durable enough for that. It also scratches easily so make sure that you get those rail protectors on as soon as possible before your little ones start teething. The Davinci Emily crib is great for twins as it saves space as well as grows with your child. It is promoted as being long-lasting and claims to be sturdy enough to use well into your child’s teenage years. So you are definitely getting your money’s worth. It has 4 mattress adjustment levels and comes with a waterproof pad – very useful for those fun potty training years. This crib can also convert to a twin bed but you must purchase the conversion equipment separately. While you can install bed rails to the twin bed, those too must be purchased separately. Another drawback of the Davinci Emily is that though it is sturdy and will last a long time, it does scratch easily. This is important to keep in mind before those teething stages begin. It is also recommended that you purchase teething crib rail covers as soon as possible. This will help prevent your little one from making big teeth indents into the wood. You can find the latest price for the Davinci Emily here. Dream on Me 3 in 1 Aden Convertible Mini Crib is another great crib space-saver. It only takes up 2’ x 3’ of floor space which makes it pretty easy to fit two cribs together if your space is small. With a solid pine finish making, it’ll look sleek and beautiful in any room. The Aden also converts from a crib to a day bed and then to a twin bed. While this model is great at growing with your little one, you will need to get a side rail for it. Especially if your baby is a big mover when sleeping, so you can ensure that they won’t fall out. This will have to be purchased separately and DIY install. In conclusion, this Dream On Me crib is very reasonably priced and it will grow with your little one through toddlerhood. Be sure to check out our other great articles, including buying strollers for twins, baby monitors for twins and how to save money when expecting multiples.